When running your own business, it can be easy to believe that contracts can wait. But getting the best (or avoiding the worst) from contracts is often a major factor in how well and how quickly a business succeeds. 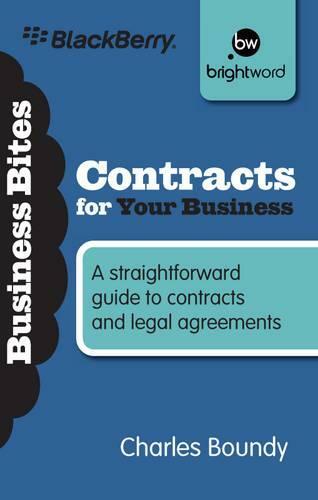 This book, from legal expert and entrepreneur Charles Boundy, provides business owners and managers with everything they need to stay on top of contracts and avoid getting bogged down in legalese. The book gives an easy-to-follow overview of: how to make or avoid making a contract; what to include and what to look for in contracts; how to have a contract achieve what you want at the price you have agreed; how to identify and manage major contract risks; how to approach the negotiation of key issues; how to draft and manage a contract to best effect; what to do (and not do) if things go wrong. A focused guide for the time-pressed, this is an indispensable tool for all businesses. Read it and stay successfully on top of the many contractual issues that businesses face every week.